When Silencia´s dam Salaterka was born I knew that I would love to breed her to one of the young stallions in Poland, the 1995 Polish National Champion Stallion Ecaho (Pepton x Etruria), a stallion with a great charisma and beauty and out of one of our times most amazing mares - Etruria. 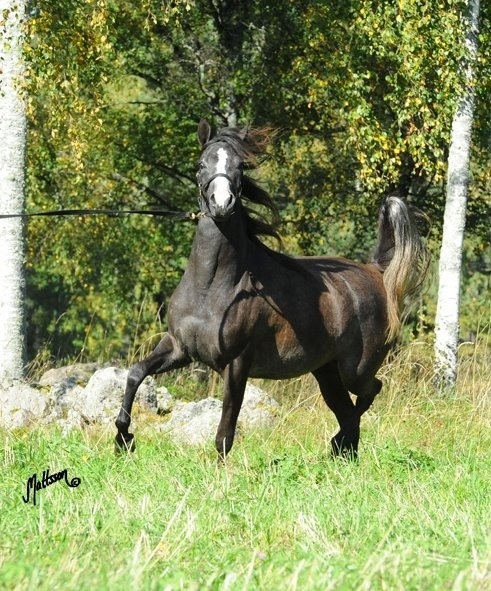 I also was convinced that Salaterka with her breeding would produce great with a stallion of the Ibrahim-line which would make Ecaho perfect. It would take me 11 years before I finally could make the dream come through and 12 years before I saw the result. When I helped Silencia into this world and my friend who was outside the stall asked if it was a colt or a filly I just couldn´t get a word out except "good girl, you are such a great girl Salaterka". The filly - yes, it was a filly! - was AMAZING with a head that was unbelievable and a strong body and a super long neck. My feeling had been totally right - this was a perfect combination! Silencia´s sire Ecaho is by the Race Horse of the Year Pepton (Bandos x Pemba) who also was the 1989 Polish National Champion Stallion. Ecaho´s dam Etruria (Palas x Etna) was Director Krzystalowicz´s favourite mare and she has won all that is worth winning, World Champion, European Champion, Polish National Champion and she was awarded with the first WAHO trophy ever in Poland for her amazing achievements in the showring but foremost as a broodmare.